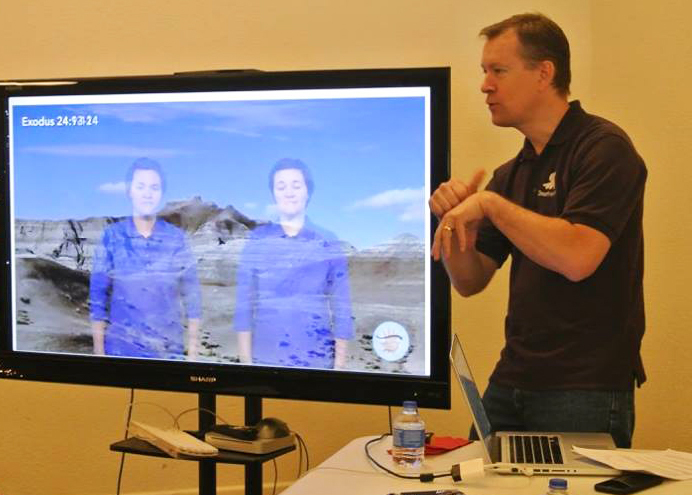 USA (MNN) — Today begins a new two-part series focusing on the Deaf community. Scripture engagement is a known concept in the hearing Church, but it’s severely lacking in the Deaf world. Donna Valverde-Hummel works with Deaf Bible Society on developing new Deaf-centric Scripture engagement methods. “Scripture engagement for Deaf people is not only reading the printed Bible,” she explains. Why won’t existing methods work? SIL International defines Scripture engagement as “accessing, understanding and interacting meaningfully with the life-changing message of the Scriptures.” Specific engagement methods vary by language group and culture; what resonates with one people group might not be effective for another. Sign language Scripture is available for free via the Deaf Bible app. It is the same in the Deaf world. Valverde-Hummel says Scripture engagement methods that work in the English-speaking community are not effective for people who use American Sign Language (ASL). Learn why ASL and English are different languages. The good news is ASL has the most translated Scripture of any sign language used worldwide. No sign language has a complete Bible, but there is a complete New Testament in ASL. Watch some passages here. Again, Valverde-Hummel reiterates, Deaf people can engage with God’s Word in English to a certain extent. However, a barrier still exists because English is a second language for American Deaf. Teaching Deaf how to engage with sign language Scripture removes that obstacle, she explains. Sign language Scripture engagement: how? The Scripture engagement program is still in development, Valverde-Hummel says, but the training has two primary aspects. 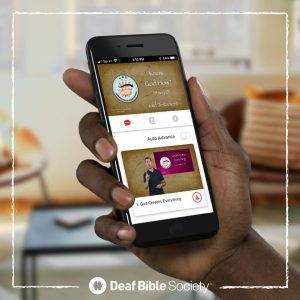 She describes Part One as “New Mindset.” It’s about making Deaf and hearing Christians aware of the need, and introducing them to the sign language Scriptures available through Deaf Bible’s digital platform. Part Two, Valverde-Hummel continues, is “New Concept.” In this phase, she and other members of Deaf Bible’s team teach Deaf believers how to use sign language Scripture in sermons, Bible studies, etc. They also encourage Deaf Christians to find a method that resonates most with each individual. 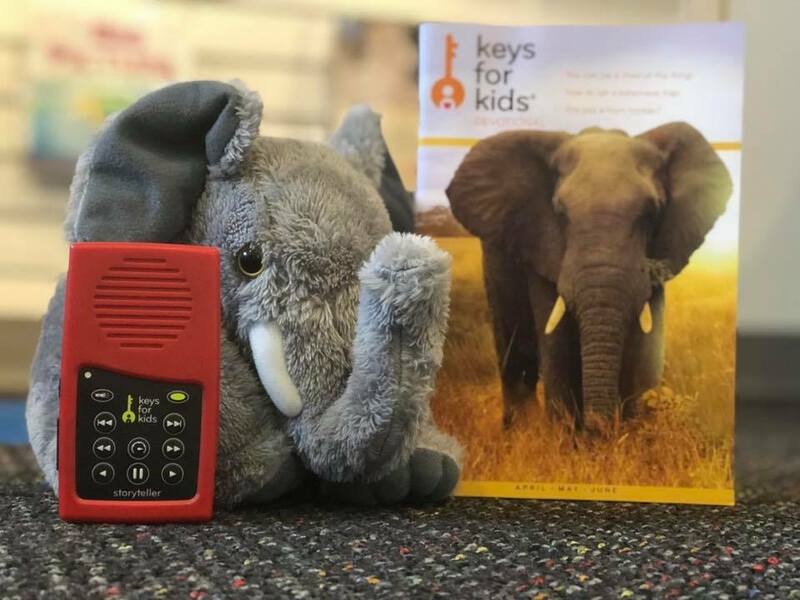 Even if you’re not Deaf and you don’t know sign language, there’s a place for you in this story. “Definitely yes, you guys can be involved!” Valverde-Hummel says. “Hearing people are very welcome. 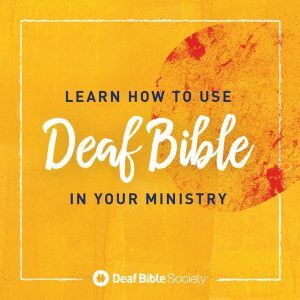 Learn how to partner with Deaf Bible Society. Header image courtesy of Deaf Harbor, a Bible translation group which partners with Deaf Bible Society and DOOR International. Pray for Donna Valverde-Hubbard and others who are developing Deaf Bible Society’s Scripture engagement program. Ask the Lord to give them insight and wisdom. Pray for Deaf believers learning how to “dig deeper” in God’s Word. Pray for new levels of revelation and intimacy with God. Ask God how He wants you to respond, and then take action in obedience. Asia Bibi: is she in Pakistan?